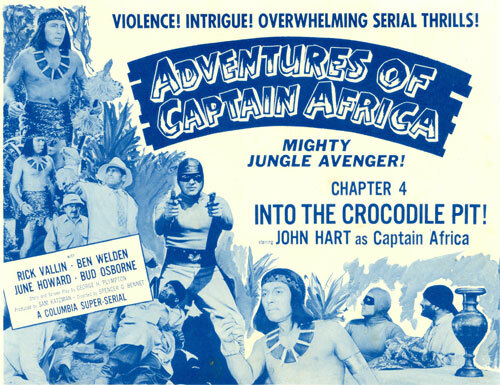 Serial Report Chapter 61-John Hart, Jack Armstrong, Adventures of Captain Africa, Sam Katzman, Muriel Evans. 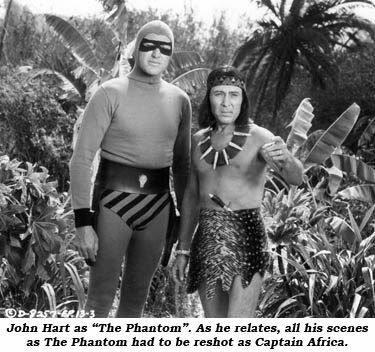 John Hart, best remembered for his two TV series, “Hawkeye” (based on James Fenimore Cooper’s LAST OF THE MOHICANS), and as Clayton Moore’s replacement for a season as “The Lone Ranger”, also appeared in a number of serials. John was born in Los Angeles, CA, December 13, 1917. 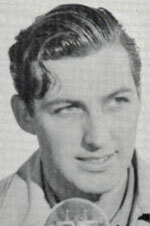 One of his closest buddies at school was a kid named Bill Beedle, who later became famous as William Holden. “We had a good drama department so we took drama,” John explained. “My mother was a drama critic and was at Pasadena Playhouse a lot. So we went up there and I started doing little theatre all over. Finally, a friend of somebody who was at Myron Selznick’s Agency got me a job on DeMille’s ‘Buccaneer’ about 1937. Everybody liked me so I got a contract at Paramount and was there for a year and a half.” Thus began John’s film career in which he had the lead role in several serials and worked in supporting parts in a number of others. 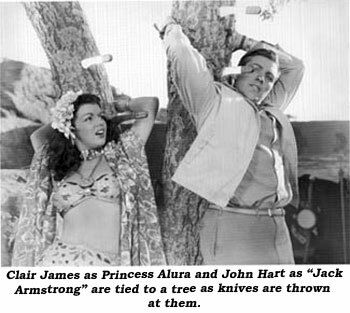 In another serial, “Jack Armstrong”, a scene called for John to be tied to a tree and have a fellow throw knives at him. They put several screw eyes around John’s head, then attached piano wire to them. The knives also had a small screw eye threaded through them then hooked to the wire, which were then shot at John with a slingshot. The knives slid along the wire and stuck into the tree next to his head. “I was glad when that was over,” he confided. John told us a funny story about working in a western serial with Terry Frost. “Terry loved to talk. 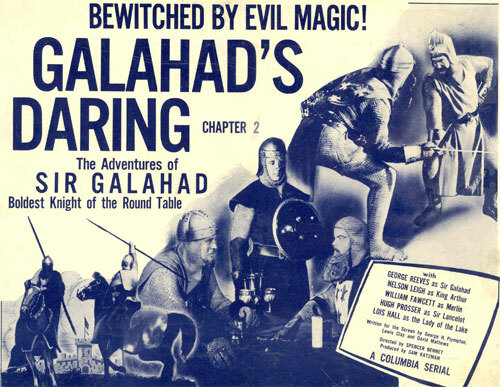 This was a Sam Katzman serial and his son Leonard was the first assistant. They had this real intricate scene set up where the stagecoach had been held up by the outlaws, they’d thrown down the strongbox, and the leading lady is in the coach. So when they shoot open the strongbox, the horses are supposed to be spooked and run off with the coach, lady and all. It took them a long time to set this all up and Frost was the one that was to shoot the gun. 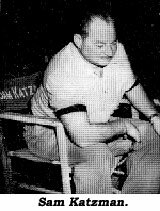 Terry had been busy talking away to his co-workers and not paying attention, so when Leonard Katzman asked, ‘Are you ready?’ Terry thought that was his cue and fired the gun. The stagecoach goes and the cameras weren’t running,” John laughed. John’s other serial credits include “Brick Bradford”, “Tex Granger”, “Batman and Robin”, “Pirates of the High Seas”, “Atom Man vs. Superman”, “Gunfighters of the Northwest”, “Great Adventures of Captain Kidd”, “Son of the Guardsman” and “Perils of the Wilderness’. In his later years John worked as associate producer on the TV series “Quincy”, where he ran all the editing, mixing, music, and sound effects. Before his death John attended various film festivals around the country where he met his fans with a genuine appreciation for those who remember his fine work in serials, movies and TV shows. Watch for the microphone above Rick Vallin and June Howard at the end of Ch. 6 of Columbia’s “Adventures of Captain Africa”. There’s mention of Sam’s sister Ruth, “an attractive blonde of 20, who has been appearing in small roles in Katzman’s pictures since she was a child, under the name of Ruth Kaye. 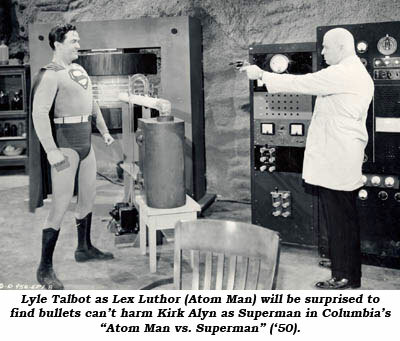 In ‘Atom Man vs. Superman’ she plays a telephone operator. For years now Sam’s annual income has never fallen below $100,000. In 1937 he made his first serial, ‘Blake of Scotland Yard’. Sam bought the story from Robert F. Hill, a director-writer, at a price under $3,000. In anybody’s book this was a bargain. The purchase price included Hill’s services as a writer and director and, moreover, he helped design the sets, although that wasn’t part of the deal. The legend of Sam the Man will no doubt add luster as the years go by. At the conclusion of Ch. 8 of “Roar of the Iron Horse”, Jock Mahoney and William Fawcett simply cover their faces and cower in a cabin corner as an explosion erupts. However, in Ch. 9 they never cover and cower, they dive out a window before the blast. Born in Minneapolis, MN, of Norwegian descent, Muriel Evans began acting as a child and by 16 was working in silent films in 1926. 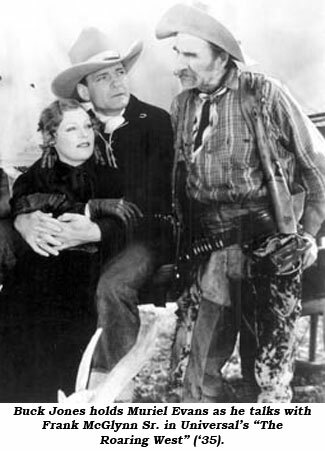 She graduated easily to talkies with her first western being “The Roaring West” serial with Buck Jones (‘35 Universal). 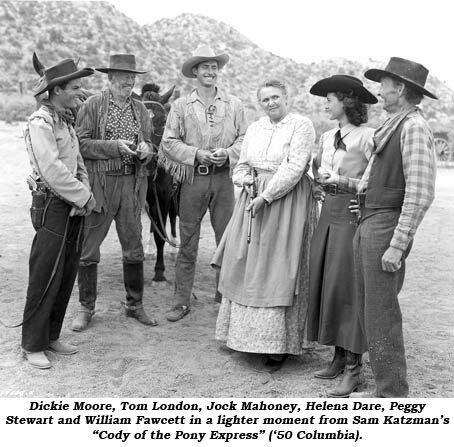 She made B-westerns in the ‘30s with Jones, Hopalong Cassidy, John Wayne and Tex Ritter. She married a stockbroker in the late ‘30s essentially ending her film career. Evans, 90, died October 26, 2000, of colon cancer at the Motion Picture Home in Woodland Hills, CA.